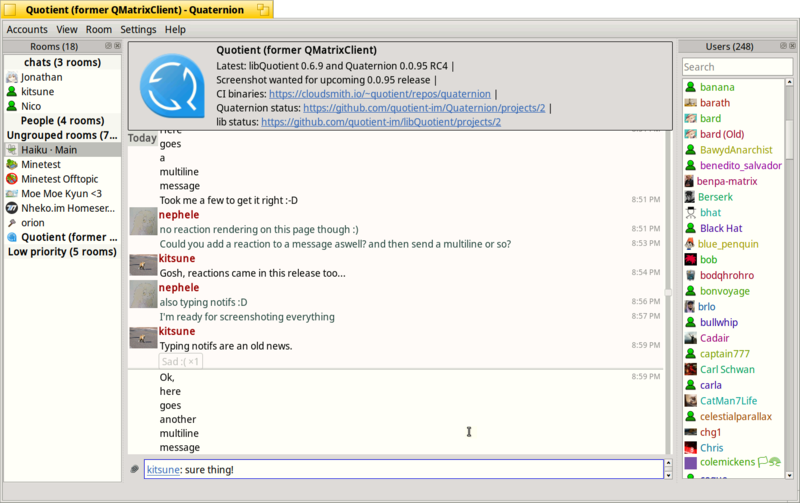 Quaternion is a cross-platform Qt5-based desktop IM client for Matrix, a reference desktop application using libQMatrixClient. Source code, issue tracker, roadmap etc. can be found at GitHub. Releases (with links to cross-platform source code archives, as well as binaries for Windows and macOS) are published at the GitHub Releases page. You can also find Quaternion in various package repositories. Most of talking around Quaternion happens in the Matrix room (see above); aside from that, news about the library are regularly posted to This Week in Matrix. Welcome, and have fun!